The Japanese Yen has strengthened sharply so far this year. The currency soared to its strongest position against the US Dollar since October 2014 amid a combination of safe-haven flows and the surprising absence of additional monetary easing from the Bank of Japan (BoJ). Japanese authorities have continued to verbally intervene in recent weeks, although they have stayed clear of formal intervention in the FX markets. A number of senior officials, including Prime Minister Shinzo Abe and central bank Governor Haruhiko Kuroda, have opened up the possibility that the central bank could intervene in order to weaken the Yen. The recent sharp rally in the Yen has defied economic fundamentals in Japan, which continue to disappoint. The Japanese economy has shown zero growth over the past two quarters, the worst performance among G10 economies. 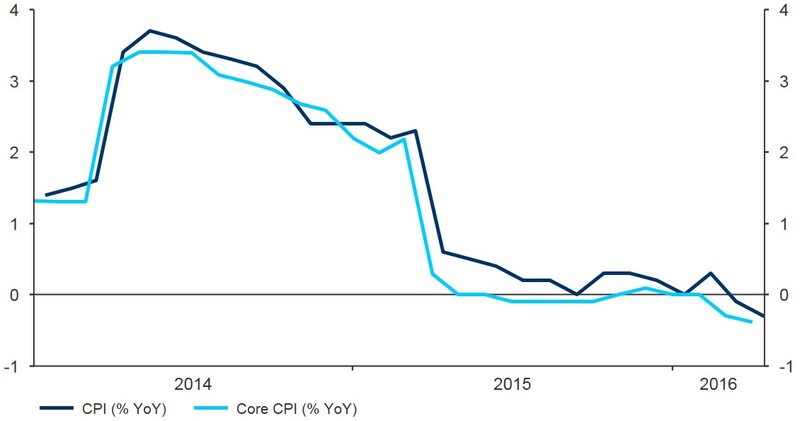 Headline inflation has returned to negative territory for the first time since Japan’s sales tax hike was taken out of the index, declining by 0.3% in the year to April and remaining considerably below the BoJ’s 2% inflation target (Figure 1). This sharp Yen rally has been all the more surprising since the Bank of Japan (BoJ) cut its interest rate to -0.1% in January. Monetary policy was left unchanged at the April meeting, with policymakers voting overwhelmingly (8-1) to continue purchasing 80 trillion Yen a year in asset purchases. However, the BoJ did again push back its forecast for hitting its 2% inflation target to sometime in fiscal 2017, the fourth delay in a year. What does the future hold for JPY? We believe that already loose monetary policy from the Bank of Japan and the possibility of additional monetary easing, including intervention in the currency market, should recommence the Yen’s downward trend against almost every major currency. We maintain our forecast for long-term Yen depreciation, but adjust the timetable to reflect recent unexpected strength. Get in touch to discuss your Japanese Yen exposure.